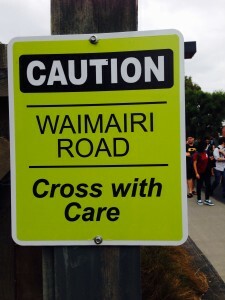 Waimairi Road – CROSS WITH CARE! With lots more lectures happening over at Dovedale this year, we all need to take extra care when crossing Waimairi Road. Traffic has been slowed to 30kph, but until we get a permanent signalised crossing in place, please make good use of the safety island in the centre of the road. Look out for yourself, others and traffic at all times….. Check left, check right – and check back over your shoulder! Previous PostHow to: sort out a Mardi Gras outfit!Next PostHave you read yesterday’s student email?